Megastar Chiranjeevi with the ladies of his house. 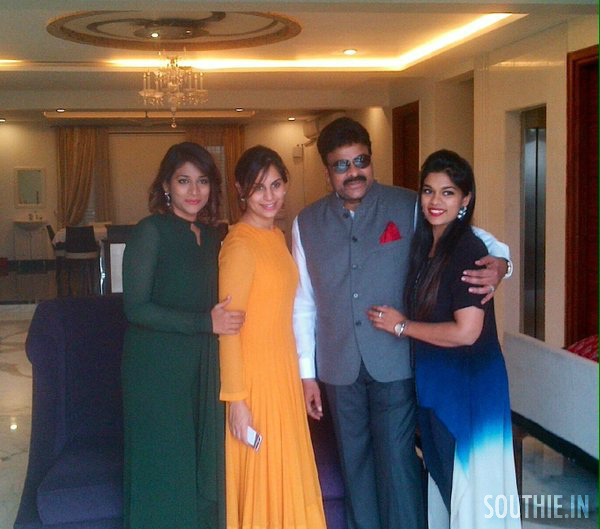 Home/NEWS/Megastar Chiranjeevi with the ladies of his house. Megastar Chiranjeevi with the ladies of his house. Chiranjeevi and Daughters. A candid photo at a family gathering. Megastar Chiranjeevi’s latest image with his daughters Sushmita and Sreeja and daughter in law Upasna were at a Family gathering. Megastar Chiranjeevi looks stunning and is gearing up to for his 150th movie the remake of Kaththi. the remake of Kaththi would start in march on the birthday of Ram Charan and would be releasing somewhere in the second half of 2016. Ram Charan is producing the movie along with the producers of Vijay’s Kaththi Lyca productions.